Study identifies ‘molecular trick’ used by bacteria to bypass the blood-brain barrier. The bacteria that sneak past the brain’s defenses to cause deadly bacterial meningitis are clever adversaries. Bacteria use various molecular tricks bacteria use to convince their host that they are harmless and cause disease. Now, researchers at San Diego State University have identified the molecular warning signal that bacteria take advantage of to induce the brain’s cellular armour to temporarily break down, letting in the bacterial horde. Their discovery could have far-reaching implications for treating and preventing bacterial meningitis. The opensource study is published in the Journal of Clinical Investigation. 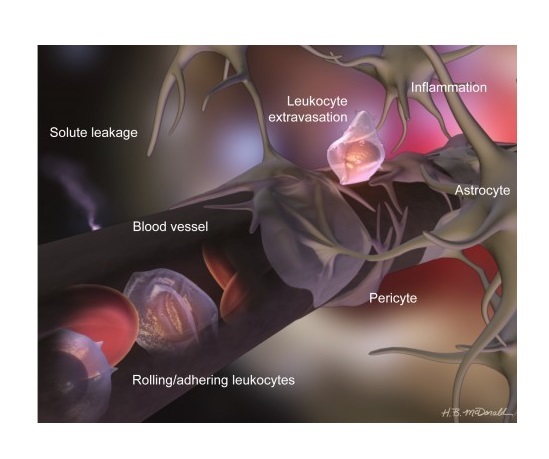 The team state that the blood-brain barrier is a thin network of blood vessels whose cells abut each other very closely, forming protein junctions too tight for bacteria and viruses to fit through. The barrier’s purpose is to prevent unwanted material from crossing over from the surrounding bloodstream into brain tissue. The cells that form this barrier can selectively let through nutrients and other approved molecules needed for normal brain function. When bacteria or viruses do manage to slip past the blood-brain barrier and infect brain tissue, it can result in bacterial meningitis, a frequently deadly disease caused when the brain becomes dangerously inflamed. Using cell cultures, zebrafish and mice as models the current study investigated how one type of bacteria, group B streptococcus, gets through the brain’s defenses. By observing the bacteria’s advance at different points in time and analyzing which molecular processes were active at the time, the researchers discovered an interesting result. When receptors along the blood side of the blood-brain barrier detect group B strep, the system fires off a molecular danger signal. However, tied into this protective molecular signal is another detrimental signal. The data findings showed that when these blood-brain barrier cells fire off their danger signal, it not only induces the brain’s molecular ‘help’ response but also induces a gene to produce a transcription factor protein known as Snail1 that contributes the breakdown of the barrier’s tight junctions. In doing so, the barrier unwittingly destroys its own integrity and permits the bacteria to enter the brain. The current study is the first to look at Snail1 in the context of meningitis with previous studies describing Snail1 as a factor of invasive cancer. The team surmise that understanding this process could allow scientists to develop therapeutics that temporarily control Snail1 expression and prevent the blood-brain barrier from acting on the hijacked self-destruct signal. Additionally, it might also allow researchers to harness the same process for good, designing drugs that tell the blood-brain barrier to let them through so they can fight various brain diseases. The BBB is also covered in Astrocytes. Credit: Dr. Danica Stanimirovic.